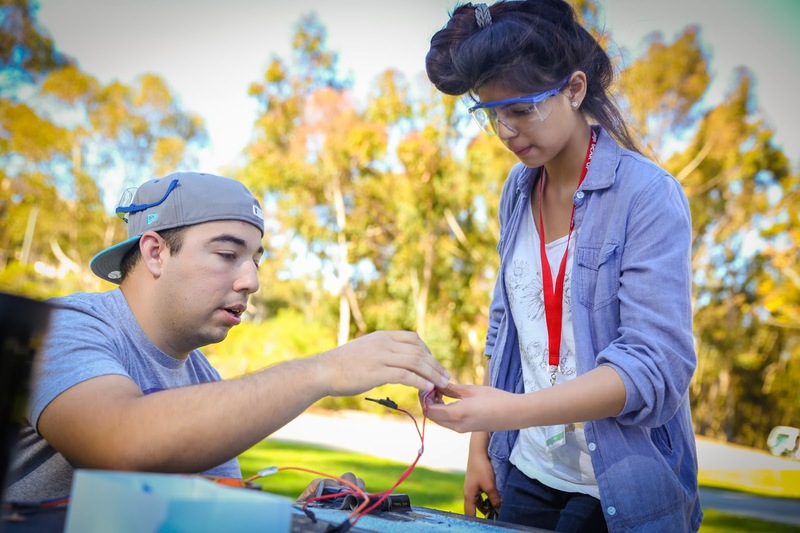 A team of UC San Diego students is a finalist in the Cornell Cup, a prestigious engineering competition, and now you can help support them! Each team writes a blog for the competition and the public has now been invited to vote on the blogs. You can support the UC San Diego team by voting here. The first round of voting ends Feb. 14, with a second round running Feb. 15 to April 2. So vote early and vote often! Team FANGS is building a ground vehicle that will serve as an observation platform to capture unique, close-quarters footage of wolves at night. The team, which started off as an Engineers for Exploration project here on campus, works closely with the California Wolf Center, located in Julian, east of San Diego. The Cornell Cup USA, sponsored by Intel, is a college-level design competition created to challenge student teams to use the newest innovative applications of embedded technology in creative ways. All finalists will converge on the Walt Disney World Resort in Florida in May to win up to $10,000. The von Liebig Entrepreneurism Center, Moxie Center, and Gordon Center -- all part of the UC San Diego Jacobs School of Engineering -- are pleased to announce the Triton Entrepreneur Network (TEN). TEN will have monthly events to bring in speakers and entrepreneurs to talk about topics that matter to innovatora. The first speaker is Dr. Robert Akins, Chief Technology Strategist of ASML and Senior Vice President of Cymer Technologies Division (and a UC San Diego alumnus). Read more about Akins, Richard Sandstrom, Cymer and ASML in this feature in the UC San Diego Triton Magazine. When: The first TEN event will be on Thursday February 13th from 12 pm - 1:30 pm. Jacobs School of Engineering "Pi Run"
The 3rd annual Jacobs School of Engineering Pi-Mile (3.14) Run/Walk is on...you guessed it...3/14. WHO: Anyone who is interested (even non-engineers!). 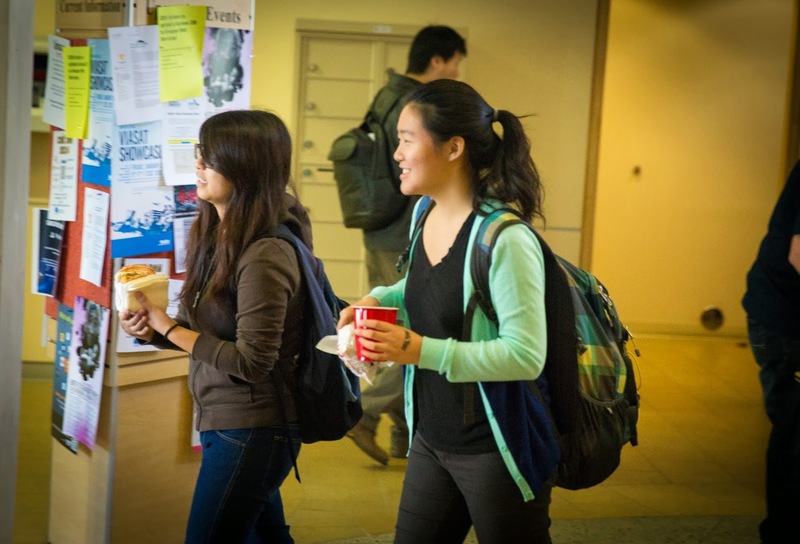 WHAT: The Jacobs School of Engineering at UC San Diego is hosting the 3rd annual pi-mile (3.14) run/walk sponsored by the Jacobs Graduate Student Council (JGSC), and the Triton Engineering Student Council (TESC). Bear Courtyard (between the Bioengineering and Computer Science and Engineering Buildings) - see route map. WHEN: Friday March 14th, 2014 at 12:00pm. WHY: To benefit the San Diego Science Alliance (http://sdsa.org/) - An organization that fosters K-12 science education in San Diego. REGISTRATION for the event is $10, which includes a free t-shirt and a slice of delicious pie! Over 40 students, mentors and advisors gathered Jan.29 at the Moxie/ Rady PitchMatch Mixer for networking opportunities and pitches of new ideas. 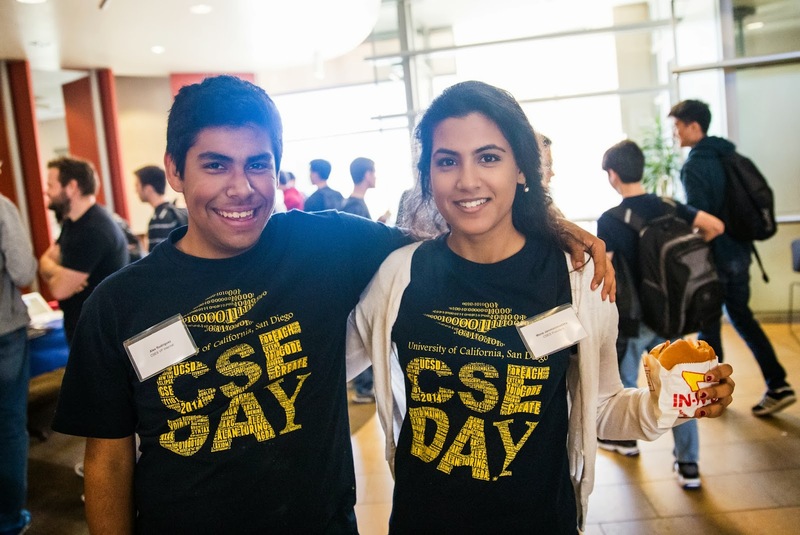 The Moxie Center for Student Entrepreneurship was founded within the Jacobs School of Engineering in 2012 to provide an educational program in entrepreneurship open to all UC San Diego students. 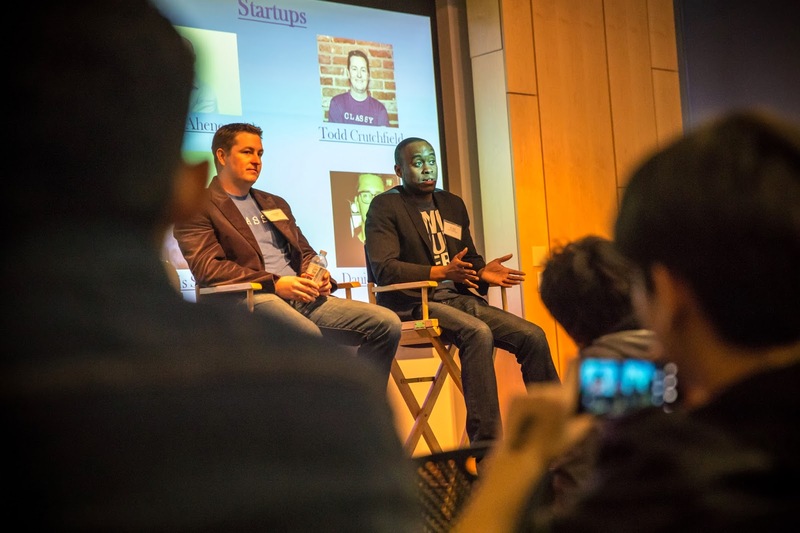 At the PitchMatch Mixer, 15 Startups pitched their ideas to a panel of judges from the business community. Competitors entered Round 1 with 60-seconds pitches on the general idea of their product or service. Round 2 selected 5 semi-finalists to discuss customers. From there, 2 finalists were selected for Round 3 where competition was discussed. Congratulations to Martyn Gross from "Skylit", a Rady School StartR Accelerator Program participant, for wining yesterday's PitchMatch competition! Former chairman of Northern Virginia Technology Council (NVTC) and Network Solutions (NSI), Michael Daniels will give a talk on the commercialization of the Internet in the 1990s, as well as offer a glimpse into the future challenges on Internet regulation, security and privacy issues. With co-author Bob Beyster, founder, former CEO and chairman of Science Applications International Corporation (SAIC), Daniels recently published the book Names, Numbers, and Network Solutions. It is the story of NSI, then a small Virginia technology company, that helped bring about the commercialization of the Internet by providing access to the network and its domain name system. Daniels and Beyster provide an insider’s view of the process of commercializing government-funded technology, and how success is anything but inevitable. Mike will be available to sign books, which can be purchased at the event or via Amazon. This is part of the Rady School of Management 10thAnniversary Speakers Series. When: Tuesday, February 25, 2014 · 6:00 p.m. - 7:30 p.m.
"Making sure we didn't step on each others code." That's one of the quotes from a video about Jacobs School of Engineering students who spent the summer interning at Cubic as part of the Team Internship Program here at the Jacobs School. The snipped of quote comes from a student talking about the challenges of working as a team on a software project. It's also a nice bit of poetic language. Dear San Diego Tech Community! The Department of Energy is hosting a hackathon in support of its just-announced "Apps for Energy" contest, in which the Department is awarding $100,000 for the best web/mobile apps that use a featured dataset, tool or idea to help solve a pressing energy-related challenge. What: A chance to form teams, discuss ideas and get started working on apps to submit to the Dept. of Energy's $100k "Apps for Energy" contest. Prizes will be offered for the best demos. Who: You! We need developers, designers, UX experts, product folks, business types -- basically anyone with an interest in creating web/mobile products that help solve an energy challenge. 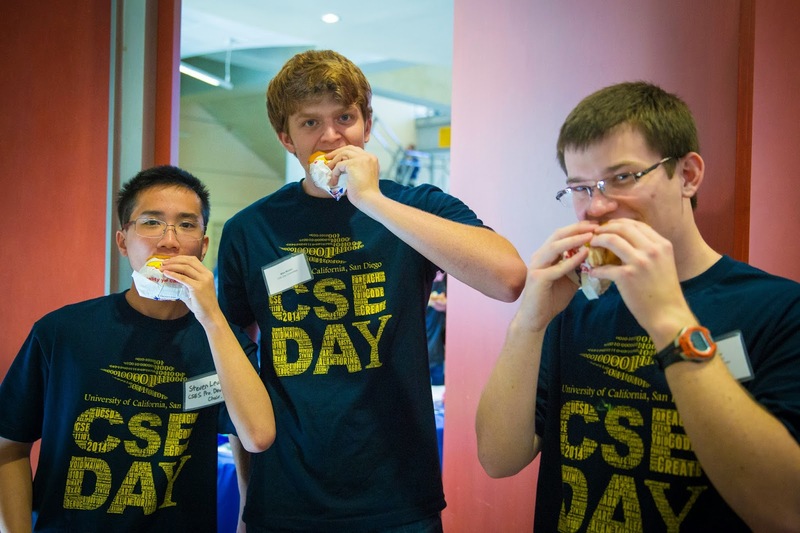 Tech talks, a Q&A titled 'the secrets of recruitment' and of course, In-N-Out burgers, where the highlights of CSE Day Jan. 23 here at the Jacobs School. The event's goal was to show students the different paths available to them after graduation and how best to navigate them. This year's program included industry talks by Sean Baumann, lead of the architecture team responsible for product development and software engineering for Life Technologies' Cloud Platform-as-a-Service applications and by Adrienne Milner, a neuromorphic software engineer with Qualcomm Research, who leads the effort to manifest biological networks in robots and is developing a system to rain neural networks. 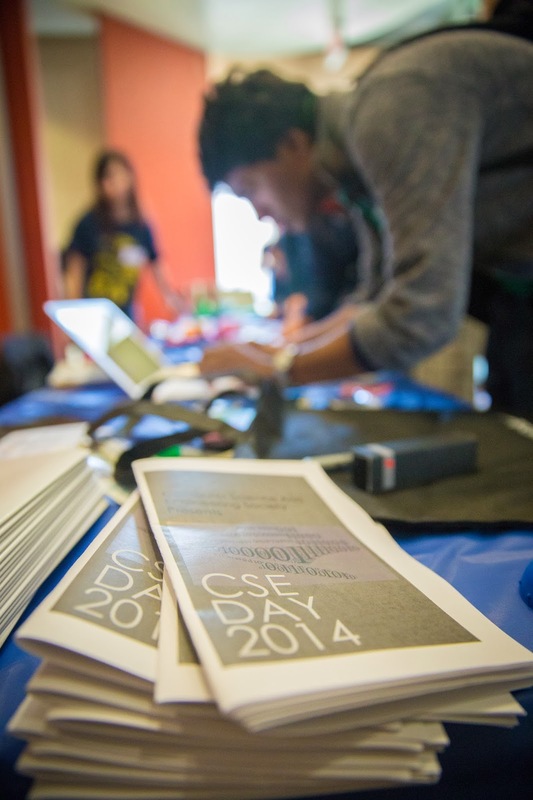 The event also featured a talk on automotive security by CSE Prof. Stefan Savage. 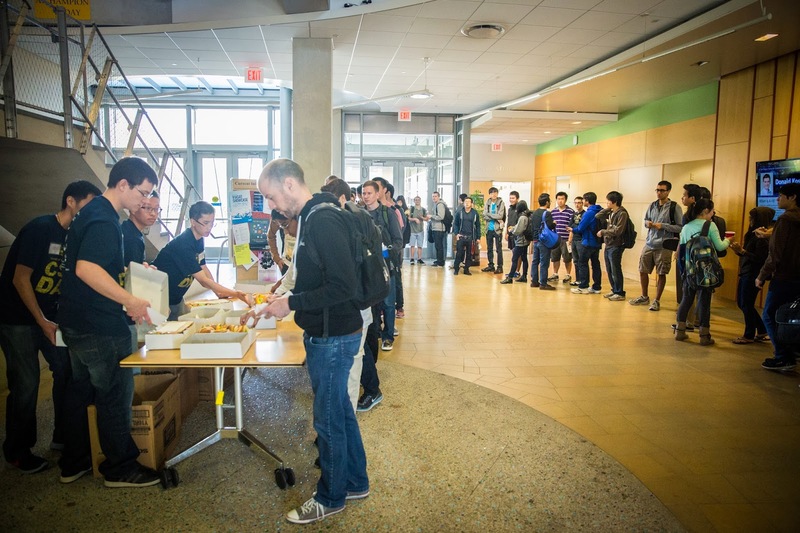 All events drew a large crowd--especially the In-N-Out burgers at lunch. "Three, two, one!" 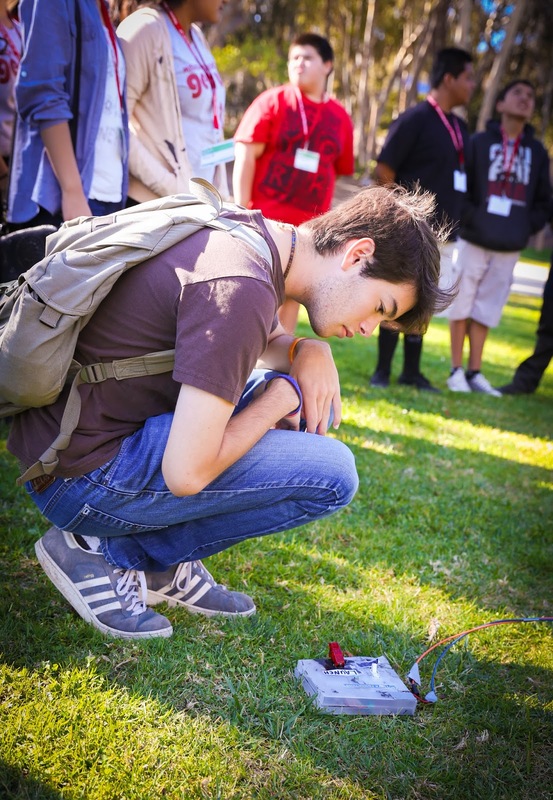 Students from Mission Middle School in Escondido counted down as one of them pressed a button that ignited a rocket engine securely fastened to a table on Warren Mall. 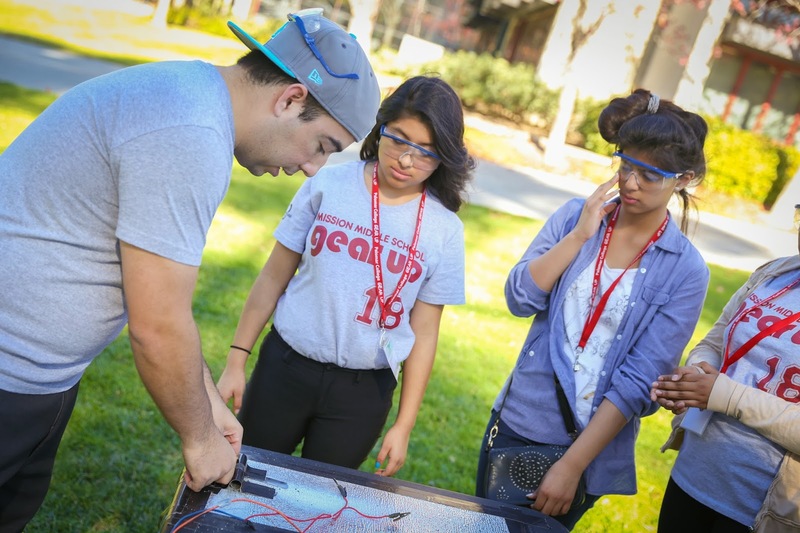 It was all part of an event set up by Palomar College's Gear Up program. 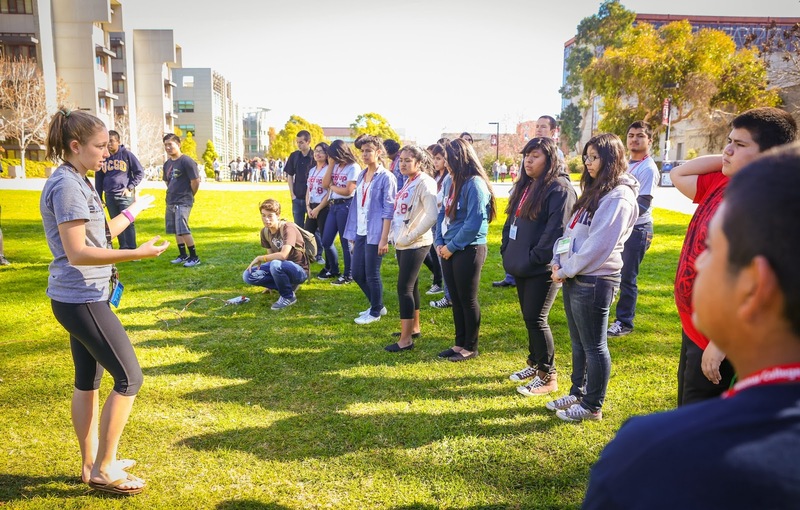 The program designed to create a college-going culture in schools in North San Diego County. 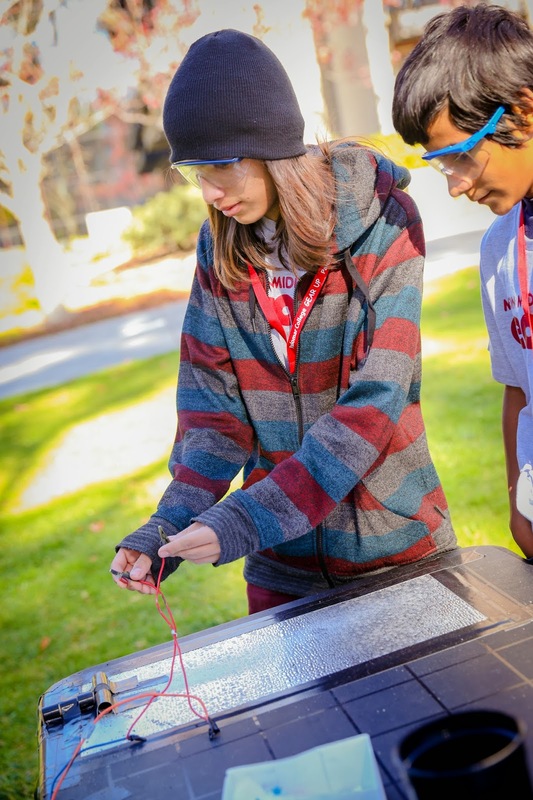 More than 180 middle school students fanned across the UC San Diego campus Tuesday Jan. 14. 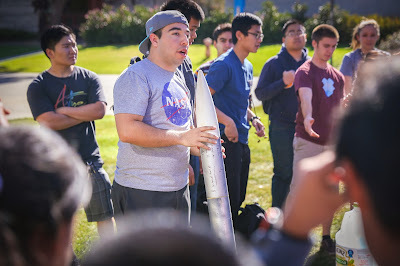 One of the stops on their itinerary was a demonstration by the Triton Rocket Club, whose members are mostly engineering students. "Rocket science, blowing things up: students are doing this for a living," said Nico Montoya, an IDEA scholar and president of the Triton Rocket Club. "It's an actual career." Montoya speaks from experience. He has interned at the Jet Propulsion Laboratory and currently works on UAVs at Northrop Grumman. On a very sunny morning, he showed students how to wire a rocket engine and explained the chemical reactions involved. A few lucky students got to use the remote that actually starts up the engine. Elizabeth Flor, 13, was one of them. She let out a jubilant "I did it!" after pressing the button and seeing flames shoot out of the engine's exhaust. "It was exciting," she said. "I'd never done it. It's an intense feeling." Elizabeth wants to become a lawyer and fight for women's rights. Her parents didn't go to college, but if all goes well, she will be the fifth sibling in her family to go on to higher education after she graduates high school. Elizabeth visited the UCLA campus before coming to UC San Diego. But for a lot of her classmates, it was the first trip outside of Escondido, said Abby Algarin, Gear Up outreach coordinator at Mission Middle School. She worked with the Raza graduate student association on campus to make sure that students got to hear from graduate students and faculty with similar backgrounds. Students visibly connected with the speakers who shared some of their experiences, said Suzan Varga, a Mission Middle School teacher and one of the chaperones on the trip. "What I feel as a teacher is that there is a light at the end of the tunnel," she said. "It was powerful." Jacobs School engineers help create robot with perfect balance--and it dances too! 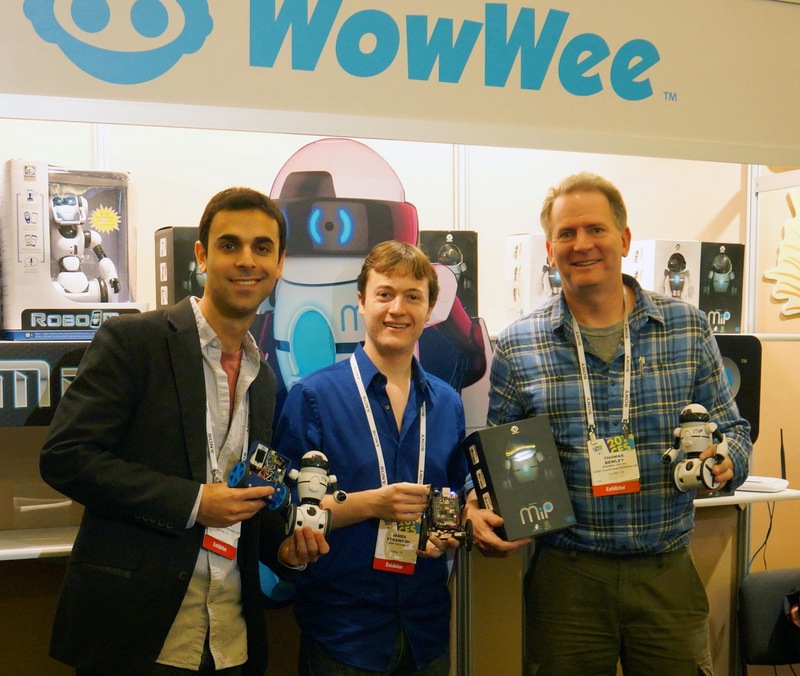 A toy robot created by Jacobs School engineers and Hong Kong-based toymaker WowWee was all the talk at the Consumer Electronics Show in Las Vegas last week. MiP (short for mobile inverted pendulum) was named a Product of the Future for 2014 for Popular Mechanics. It also earned an award for Envisioneering, Innovation and Design and was a finalist at CES' Last Gadget Standing Competition. The WowWee MiP is a charming, two-wheeled Segway 'bot that has some impressive balance. The robot is the brain child of toy designers at WowWee and a group of graduate students in the Coordinated Robotics Lab here at the Jacobs School, which is led by mechanical and engineering professor Tom Bewley. "It was a bit overwhelming at first but an exciting experience, at least for me personally, to be a part of the release and to help promote MiP at the WowWee booth," said Saam Ostovari, who was the lead graduate student on the MiP design. "It was a non-stop flux of press, suppliers and consumers wanting to learn about MiP. I still haven't recovered my voice from all the talking I did." See below for a video of MiP in action. Watch a video about the K’NEX Outreach Program below. 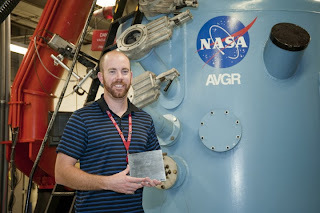 Douglas C. Hofmann, an alumnus from the Department of Mechanical and Aerospace Engineering at the UC San Diego Jacobs School of Engineering is developing bulk metallic glasses to be used as shielding for spacecraft to protect them against orbital debris impacts. For this and related work, Hofmann has been named a recipient of a Presidential Early Career Award for Scientists and Engineers (PECASE). This is the highest honor bestowed by the United States Government on science and engineering professionals in the early stages of their independent research careers. Hofmann earned a B.S. (’02) and M.S. (’03) in mechanical engineering from UC San Diego. 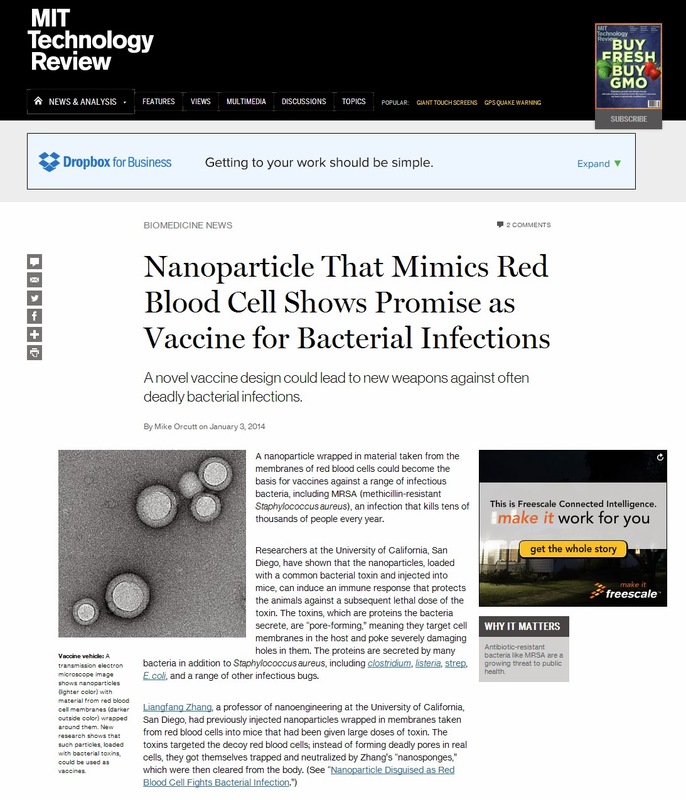 He was advised by Kenneth Vecchio, now Professor and Chair in the NanoEngineering Department at UC San Diego. Hofmann went on to earn a M.S. and Ph.D. in Materials Science at Caltech before founding the Metallurgy Laboratory at NASA JPL in 2012, where he works as a Principle Investigator. Hofmann also teaches at Caltech, where he has a Visiting Associate appointment. The current talk focuses on the science and applications of new materials for future NASA spacecraft, with emphasis on how real-world problems drive materials development. Among the materials that will be discussed are amorphous metals and bulk metallic glass composites. These materials have been developed for use as low-temperature gears for a future Mars rover, orbital debris shielding for spacecraft and satellites, net-shaped mirrors, cellular structures and optical mounts. In each application, a new material or manufacturing process enables a function that cannot be obtained through traditional techniques. Collaboration between Dr. Hofmann’s and Professor Vecchio’s groups on some of these materials will be discussed. The talk will also contain details on an upcoming NASA spaceflight experiment to the International Space Station in 2016 to perform fundamental physical science research using the new Materials Science Research Rack. Images from hypervelocity impact testing experiments performed by Hofmann and colleagues at NASA. 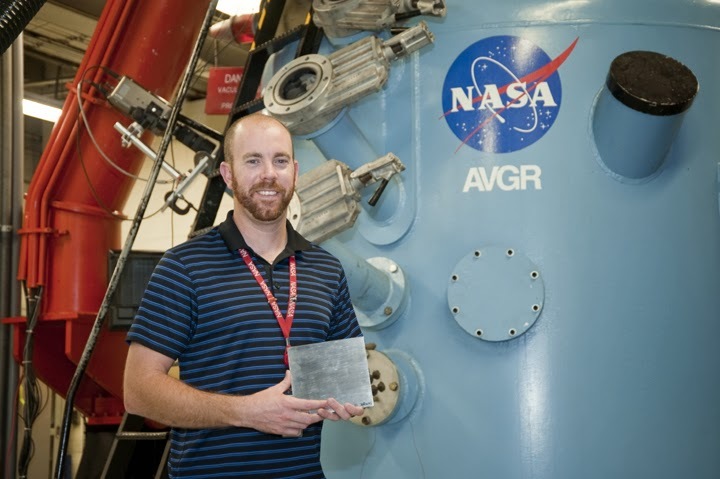 "We have been developing bulk metallic glasses to be used as shielding for spacecraft to protect them against orbital debris impacts. This is the same problem highlighted in the recent movie 'Gravity', Hoffman wrote in a recent email. The Presidential Early Career Awards, according to a statement released on the White House website, embody the high priority the Obama Administration places on producing outstanding scientists and engineers to advance the Nation’s goals, tackle grand challenges, and contribute to the American economy.